On this day in 1935, Georgie Gibbs squeaked out a close 10-round points win over the Pride of Kensington, Johnny Jadick. 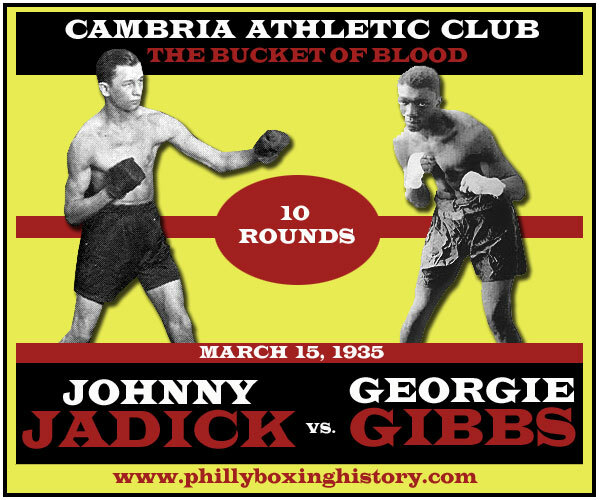 The bout was the main event of a five-fight card at the Cambria Athletic Club, in Jadick's backyard. Johnny jumped out to an early lead using his fabled left lab to score points. Gibbs, the much harder puncher, waited until round three to make his move. In that round, Gibbs staggered Jadick, shocking Johnny's hometown crowd. In the following round, Jadick battled back, brushing off his reputation as a non-puncher by nailing Gibbs with a pole-axe of a right that drove him across the ring. As the rounds wore on, the fighters stuck to their usual script. Jadick used his jab and fought carefully while Gibbs pressed the action and attacked the body. Georgie's body blows had Jadick's normally pasty torso splotchy and red, according to the newspaper accounts. By round ten the fight was close and both boxers entered that frame looking to close the show. They went toe-to-toe for the entire round. Puncher Gibbs had the edge in the reckless round and it probably earned him the decision. Still the verdict was split. The pair would fight twice more and as testament to their equality, the series would end 1-1-1.